Aquaman isn’t due until December, and for the first time this decade Warner Brothers and DC Films have not sprayed us down with marketing every minute of every day. With Aquaman they have displayed actual restraint, which means that we are only just now, six months out, starting to see the marketing machine grind into gear. 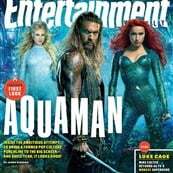 We’re seeing our first big push for Aquaman by way of Entertainment Weekly, with a cover feature, first look photos, and multiple covers. The result is fine. It looks fine. We really need to see a trailer before getting any real sense of what the hell this movie will be like, but it makes for some pretty photos. Professionally wet person Jason Momoa remains great casting for this role, with his surfer-bro vibe and perfect beachy waves. Producer Pete Safran says, “Rarely has a superhero character been married to the real-life actor as much as Aquaman and Jason Momoa.” I dunno, RDJ/Tony Stark, Chris Evans/Captain America, Gal Gadot/Wonder Woman—we’ve seen some synchronistic casting in superheroes before. But Momoa IS perfect for this role, and though Aquaman didn’t really gel in Justice League, that movie is such a mess I refuse to put that on Momoa. He certainly looks the part in all the photos, but how Momoa LOOKS is never a problem. It’s whether or not he can carry a whole movie that remains in doubt. Often, the more he talks the less effective he is, so we’ll see how it works out when he has to talk for all of a two-hour-plus movie. Other photos reveal Patrick Wilson’s man-bun, Nicole Kidman looking appropriately queenly—she plays Aquaman’s mom—and Amber Heard as Meera. I truly appreciate that they committed to “Fake As F*ck” for her hair color. I wish more superhero looks were willing to go with fun, fake hair. So many of them wear wigs, why not have fun? Meera looks fun. She looks like she knows where the rave is at. Also fun is the underwater shot revealing the shark cavalry and “sea dragons” that the Atlanteans ride. 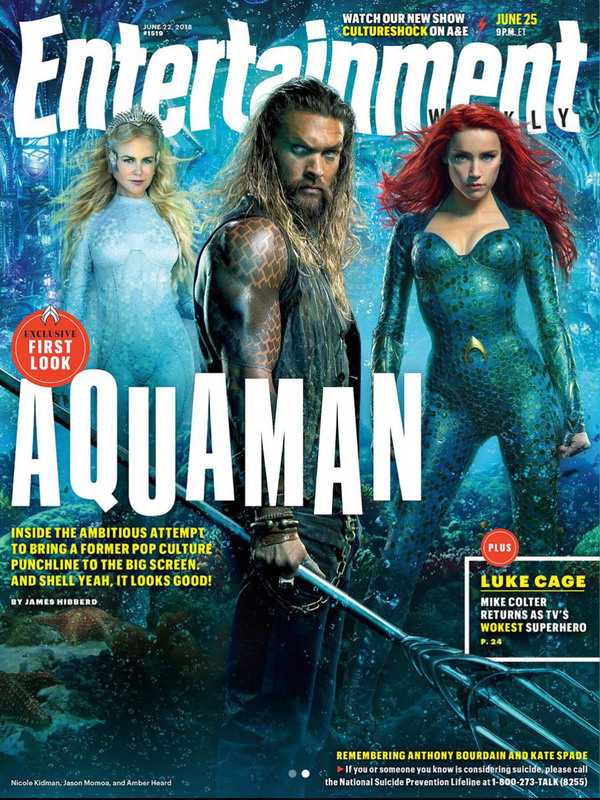 I’m not gonna lie, I am straight-up excited to see Aquaman ride a shark. One of my favorite parts of the DC fight game Injustice: Gods Among Us is when Aquaman gets sharks to eat people for him. This can be fun! It SHOULD be fun! But we won’t really know if “fun” is what they’re going for until we see a trailer. Until then, it’s just pretty photos and Jason Momoa’s great hair.